It can happen in only a instant. 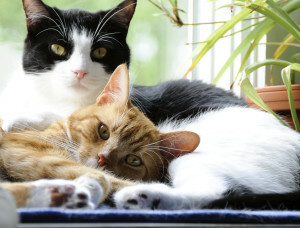 Feline companions who have been buddies for years can suddenly view each other as “the enemy” and serious fighting can follow. Just like they don’t even know each other at all. An excellent explanation for this strange behavior can be caused by a number of triggers. 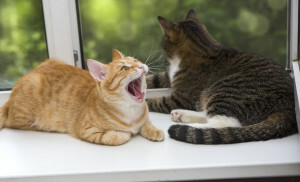 When two cats in the household who have gotten along well togeth er suddenly become aggressive toward each other, the problem is generally fear-induced aggression. Neither of the cats seeks the other out, but if they run into each other, both will act startled and attack. Usually this problem begins “by mistake” or by accident. For example, a cat “A” may be sitting in a window as an outside cat walks by. Cat “B” sees the outside cat and rushes toward the window to attack it. Unfortunately, Cat “A” happens to be in the way and sees cat “B” aggressively charging toward it. Cat “A” puffs up and hisses. Cat “B” redirects its attention to cat “A” and puffs up and hisses. Then the cats attack each other. Each acts as if the other started the fight. Neither cat knows why. Occasionally, two friendly cats may be resting when a frightening incident occurs, such as a bookshelf falling over. loud slamming of a door or even people shouting. Both cats become startled, puff up, and assume defensive postures. When they see each other in a defensive posture, they act as if the other is about to attack. Consequently, each reacts defensively, a fight ensues, and thereafter they are aggressive whenever they see each other. In order to successfully treat this type of aggression, the cats must be separated and carefully reintroduced to each other. They must become accustomed to each other again without either cat becoming afraid or aggressive. The method for reintroducing cats is the same as the protocol for introducing a new cat into the household. Remember, don’t try to handle the cats if they are aroused or agitated or you will be the victim of redirected aggression. If necessary, throw a thick towel over one of the cats so that you can safely take them to another room. Keep the cats in separate rooms for a few days. Then exchange rooms so that they can reacquaint themselves with each other’s scent. The door should be kept closed so that there is no interaction between the cats at this time. After a few days of room rotation, let the cats see each other, but not have contact with each other. This can be accomplished by securely wedging or hooking the door so the cats can peek through the crack but can’t fit through the opening. Feed the cats something especially delicious on opposite sides of the door. You can also tie two small toys together with a leather shoe lace and slide it under the door so that when one cat bats at the toy, the toy on the other side of the door moves. The goal is for each cat to associate good food and good times with the presence of the other cat. Praise the cats when they are near each other. It never helps to scold the aggressor. 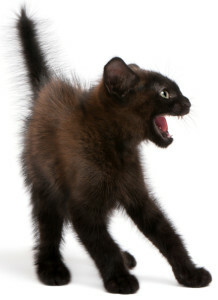 If either cat becomes extremely hostile or frightened, close the door and try again later. When the cats are relaxed with the sight of one another, then it is time to open the door. Let them be together for only a few minutes at first, gradually increasing the time each day. This process can take a few days or a few weeks depending on the personalities of the cats and the severity of their aggressive encounter. If you are patient and systematic about the reintroduction process, you will be rewarded with two cats that are, once again, purrfectly compatible.